It’s fascinating how aspects of Westernised Zen philosophy came out of Hitler’s Germany. Below is the link to a paper called “The Myth of Zen in the Art of Archery” with some extracts below that to prove the point. 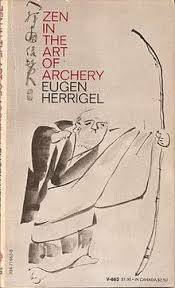 ‘Eugen Herrigel’s “Zen in the Art of Archery” has been widely read as a study of Japanese culture. By reconsidering and reorganizing Herrigel’s text and related materials, however, this paper clarifies the mythical nature of “Zen in the Art of Archery” and the process by which this myth has been generated. This paper first gives a brief history of Japanese archery and places the period at which Herrigel studied Japanese archery within that time frame. Next, it summarizes the life of Herrigel’s teacher, Awa Kenzõ. At the time Herrigel began learning the skill, Awa was just beginning to formulate his own unique ideas based on personal spiritual experiences. Awa himself had no experience in Zen nor did he unconditionally approve of Zen. By contrast, Herrigel came to Japan in search of Zen and chose Japanese archery as a method through which to approach it. The paper goes on to critically analyze two important spiritual episodes in “Zen and the Art of Archery.” What becomes clear through this analysis is the serious language barrier existing between Awa and Herrigel. The testimony of the interpreter, as well as other evidence, supports the fact that the complex spiritual episodes related in the book occurred either when there was no interpreter present, or were misinterpreted by Herrigel via the interpreter’s intentionally liberal translations. “Zen in the Art of Archery continues to be a bestseller. The Japanese language version, Yumi to Zen (1956), which represents the culmination of a circular translation process that rendered Awa’s original Japanese words into German and, then, from German back into Japanese, has altered Awa’s words to such an extent that it is impossible to ascertain his original expressions. Yet, in spite of this fact, many Japanese rely on it to acquire a certain fixed interpretation of Japanese archery. Faced with this situation, I have attempted to present a new reading of Herrigel and associated documents from a different perspective so as to clarify the mythic function that creates our conception of what constitutes “Japanese-ness.” At the same time, I have attempted to counter the tendency that has prevailed up until now to read Zen in the Art of Archery with little or no critical awareness. This paper represents only a preliminary analysis of Zen in the Art of Archery. The next step must compare and contrast Herrigel’s account with descriptions of Japanese archery written by other foreigners during the same period in order to bring to light the idiosyncratic nature of Zen in the Art of Archery and the peculiar way in which it has shaped foreign understanding of Japan and foreign interpretations of Japanese archery in particular. Next post: If there is one thing you’re going do as we go into 2018, make it this!